In this personal project my goal is to help people make better decisions for renting an OV bike. OV bikes are a great way to get around a city, but due to its popularity they often run out at specific places. No one knows what the average wait time is. The public API's only show current data, and are often not correct. I want to know how busy an OV bike station really is. This personal project is here to help me grow in PHP, AngularJS and programming in general. 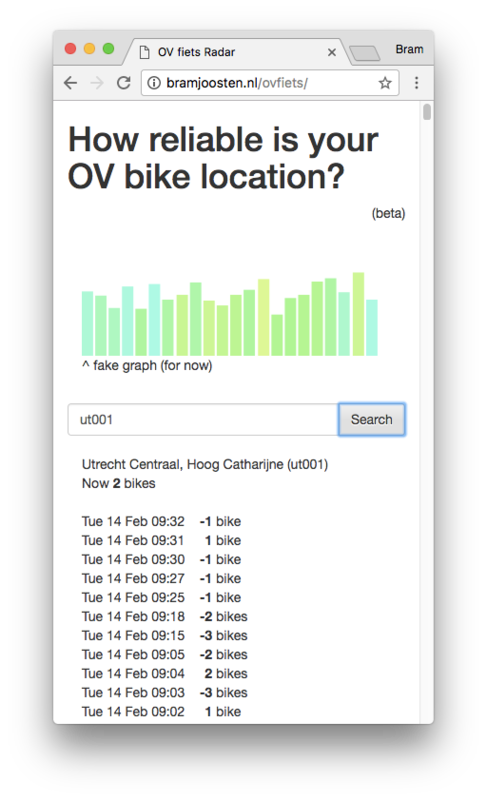 It's great to talk to OV bike employees and see if the data is correct. In general, the API data quality is very poor. Oh well, the world ain't perfect. Online competition is fierce. If a product gets popular, large companies like Bol.com and Amazon will immediately destroy any competition. That's why small webshops can't really compete by price anymore. That made me wonder. Are there other solutions? What if a webshop experience becomes unpredictable. Let's say you can win something every day. That makes you want to return, right? Slot machine generator. Store owners can build their own reels and set probability values. Personal project goals were going for a no-jquery approach so as to make a fast performing app.